The home resale market put forth another strong data set last week. Home sales prices are higher nationwide and sales volume has moved to a 2-year high. An existing home is a home which has been previously occupied. 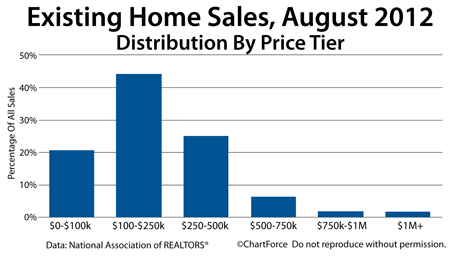 Home sales were unevenly split across price tiers, with more than half of all homes selling for less than $250,000. This suggests that the first-time home buyers and real estate investors continue to be active in today’s market as a foundation for growth is built. Also noteworthy is that “distressed homes” accounted for the smallest percentage of overall home sales since the real estate trade group starting tracking such data. In August, homes in various stages of foreclosures accounted for 12% of all sales and sold at an average discount of 19 percent below market value. Short sale homes accounted for 10% of all sales and sold at an average discount of 13 percent below market value. Of all the data in the August Existing Home Sales report, though, perhaps most relevant to today’s buyers is the shrinking national housing supply. At August’s end, there were 2.47 million homes listed for sale nationwide, a three percent increase from the month prior. However, because the pool of available home buyers is increasing more rapidly than the number of homes for sale, housing supplies fell 0.3 months to 6.1 months. This means that at the current pace of sales, the entire housing supply would be sold by March 2013. For today’s home buyers, home affordability appears poised to worsen. Mortgage rates and home prices remain low today, but market conditions like these rarely last long. Talk to your real estate agent about what options you have ahead of you. 2012 is coming to a close. By 2013, the housing recovery may be fully underway.